When I sit down for a game of Magic, I usually already know whether I’m about to win or to lose. This is not because I’m an incredibly good or bad player (I am, in fact, incredibly average)1. It’s because of the metagame. With an estimated player base of 20 million, Magic: The Gathering is the most popular trading card game in the world. Playing Magic requires careful evaluation and good strategy. If you don’t know anything about Magic, but want to inject a little knowledge from left field into your business strategy, “Business Magic” is for you. Knowing what to expect is a very useful skill. It helps to temper your expectations and prepare yourself for when you’re about to win big. Magic is not a simple game by any means of the imagination. Most tournament formats are puzzles with thousands of moving pieces. The number of cards that could be in play at any moment is staggering. But, as in most things, the number of things that actually do happen is very limited. There is a structure to them. 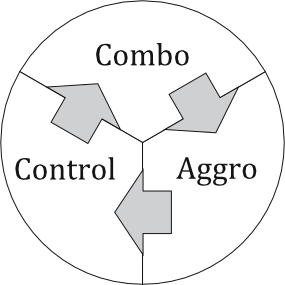 Broadly speaking, there are three archetypes: aggro, combo and control. For all its inherent chaos, Magic has always been very good about maintaining a Rock-Scissors-Paper approach to balance: Historically, combo beats aggro, aggro beats control and control beats combo. Business Magic Lesson #8: It is almost impossible to position yourself in a way that always wins. Trying to understand complex decision-making through Rock-Paper-Scissors is not applied apophenia. Instead, it is indicative of games reflecting key truths about human interaction. In this case, that every decision has an advantage and a disadvantage. Of course, in Rock-Paper-Scissors, the pros and cons of every decision are perfectly weighted in order to create a sense of balance. Real life has no such luxury, and neither does Magic. Force of Will. Illustration: Terese Nielsen. 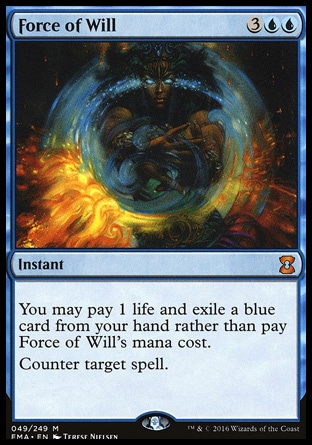 Force of Will is a card that exemplifies the relation between the archetypes. It is most commonly used as a tool for control to stop combo. Countering a spell, meaning nullifying it in its entirety, at the steep cost of one life and an additional card, is never a pleasant measure to take. But for control decks, it’s often a necessary early stopgap measure to ensure you get to the late game, where you can exercise a more systematic control. Aggro decks, meanwhile, rightly balk at including a card that demands a lot and, by definition, does nothing productive. This Rock-Paper-Scissors configuration is called the metagame, and it is in a constant state of flux. Some times might favor aggressive strategies, others might provide the right tool to establish a crushingly dominant control archetype. Hybrid strategies might pop up, depending on the diversity of the metagame. After all, hardly any business strategy will ever be equivalent to “all Rock, all the time”. The more complicated the environment gets, the more important it becomes to correctly assess where you stand in the metagame. Which challenges can you handily beat? What challenge can upend your entire situation? Assessing your position within this set of interactions can help you shift into a position that is better overall. Some players are almost pathologically incapable of playing aggressively (I’m probably one of them), gravitating more towards control roles. Others might feel more at home playing combo. Forcing these players into roles they aren’t comfortable in will not always lead to better results, although they might be better positioned on paper. In practice, your current position in the metagame probably represents your assessment of your core strengths. In this case, shifting it by too much might actually worsen your results. Instead, you should try championing change which positions you better without uprooting everything you’ve already accomplished. Let’s say you’re playing a Combo deck. The current metagame falls along the following dataset – a lot of Rock/Combo, a little less Paper/Control and almost no Scissors/Paper. For the sake of clarity, let’s also assume all draws are re-rolled. In this case, your current strategy, Combo, is an unmitigated disaster, offering you a 20% chance of winning against the field. The clear best strategy would be Control at 83%. It also represents a very radical shift which you might find impossible to implement. 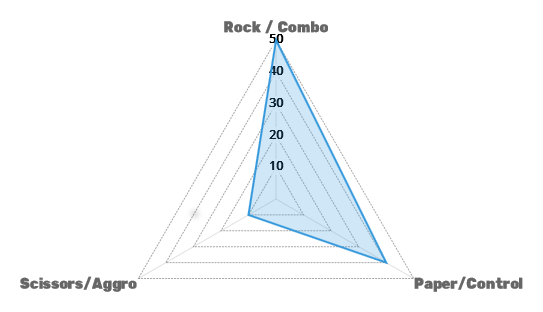 Adopting a hybrid strategy, however – half Combo, half Control – would already give you above-average odds at 56%. Find out where you stand. Focus on your strengths and gradually shift towards a position that is favorable in the metagame. Whenever I can take the time, you can find me at Magic: the Gathering tournaments all over Europe. “Business Magic” is a four-part series. Find all installments in our archive. 1 My latest notable tournament results, a 52nd place out of 216 players in Prague and a 58th place out of 82 players in Flensburg, back me up on my mediocrity. 2 Of course, Rock-Paper-Scissors has very narrow limits of usefulness as an economic model. In addition to the competency problem outlined above, there is also the fact that it there exists a stable solution – complete randomization – which, independent of opponent input, always provides a 50% chance of winning. “Closure #3: Stuff Matters” is out now! It’s just a fancy explanation of rock paper scissors. What’s the point? If youre so good, how come youve never won anything?